Today it is my pleasure to introduce to you a bird who is a true gentleman among raptors. In the three years he has been with Owl Moon he has served as both a host and a role model. 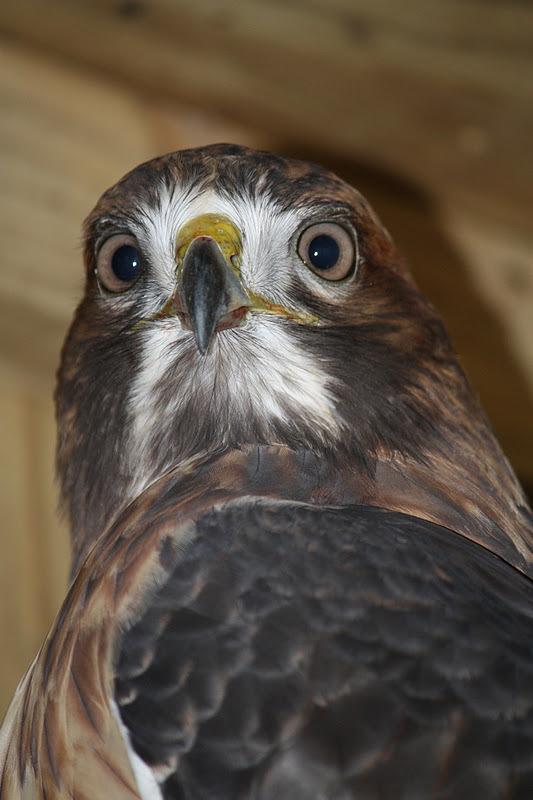 Sir Galahad, as we have come to call him, is an adult red-tailed hawk. I think he is male, but in truth I can’t know for sure. His weight is in the range of gender overlap, being high for a male and low for a female. I call him “he” because his behavior is more like that I see in males; less aggressive and less inclined to raise those crown feathers than females. 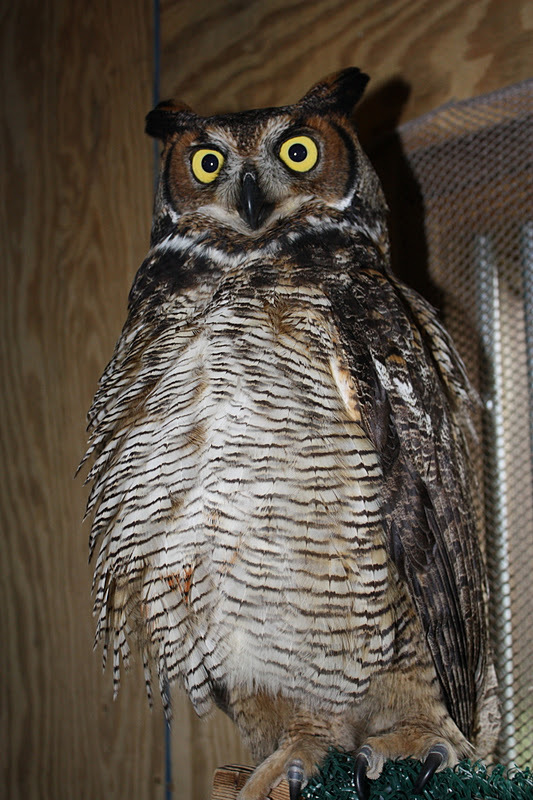 Sir Galahad left Owl Moon last Friday to begin a new life at Meadowside Nature Center in Rockville, MD. Today, I would like to take a moment to remember our time together. Sir Galahad was severely emaciated and dehydrated, so I began his treatment as soon as I got him home. There was no immediately visible wound, but there had to be a reason why he had gone hungry. I noticed a slight droop in his left wing, but I couldn’t feel a fracture. After he was re-hydrated and eating again, I brought him to Opossum Pike Vet Clinic where Dr. Barb Stastny took x-rays. No injuries were visible on the radiographs, so I kept him on cage rest for another two weeks and then moved him to an outdoor mews. Outside I noticed he could not fly to the higher perches. Rather, he worked his way up sequentially from lower perches. After another week, we tested his flight on a creance line. We found that while he could fly on the level, he was unable to gain much altitude. I knew there must be something I was not seeing so I took him to Tri-State Bird Rescue and Research in Newark, DE, where avian specialists took further x-rays and evaluated him. Dr. Erica Miller discovered an inflammation in his left wrist joint. She prescribed an anti-inflammatory drug and suggested I give him physical therapy along with the flight exercise. Erica said if his flight did not improve in two weeks, it probably never would. After the allotted time expired his condition remained unchanged. Sir Galahad needed a permanent home. Since Sir Galahad is able to fly (though not well), I wanted his home to meet certain criteria for a good quality of life. I wanted his mew to be large enough for him to spread his wings and fly. Additionally, I wanted him to be trained to fly to the glove so he could exercise his wings outside of the mew. Training to the glove would make him more comfortable with people, improving his life and also make him more useful for education programs. 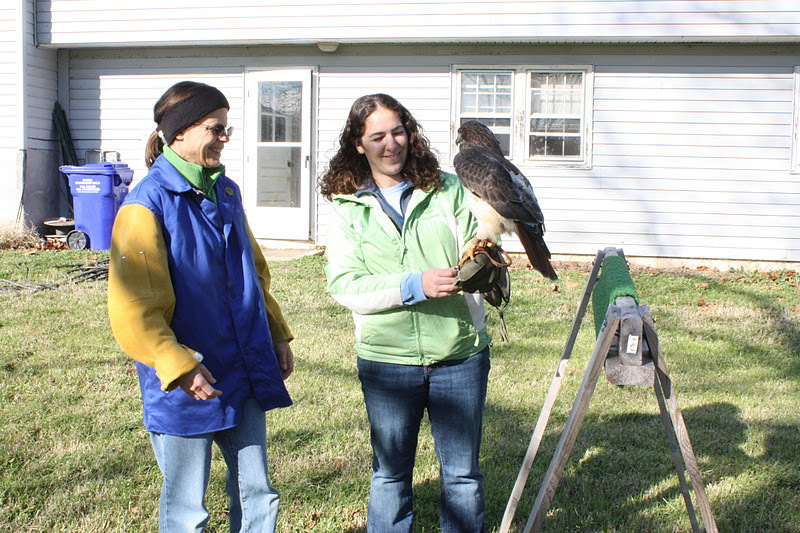 There are typically restrictions on how long a rehabilitator can keep a bird if it cannot be returned to the wild. Fortunately, Maryland Department of Natural Resources Wildlife & Heritage Service allowed me some extra time to find such a home. 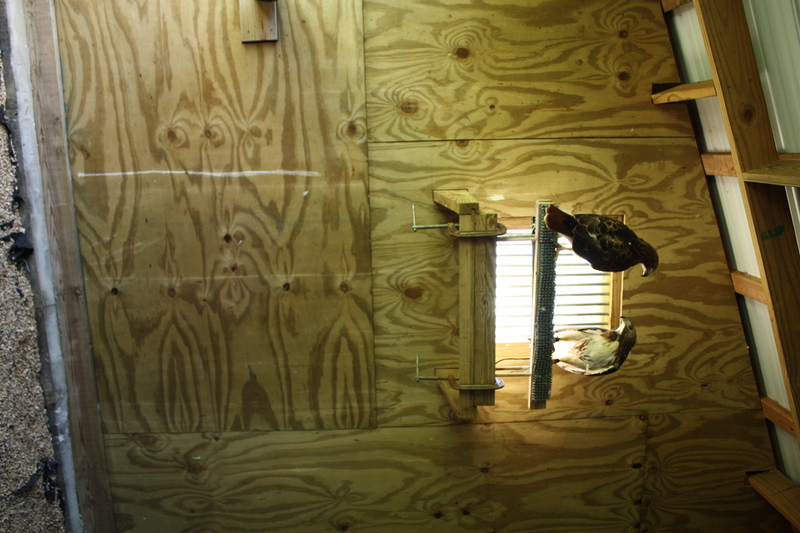 During that time, Sir Galahad hosted numerous red-tails, who out of necessity shared his home. Every newcomer was treated politely and with respect. Sir Galahad’s quiet dignity gained him the respect of his guests in return. They always behaved congenially towards each other, and with some companions I even saw mutual grooming and other signs of bonding. At times I found it emotionally difficult to separate them when it came time to release the roommate, but each time, Sir Galahad adjusted well and was just as hospitable to his next guest. Sir Galahad (left) with his companion Hunchie (right). Photograph by Suzanne Shoemaker. Over the three nesting seasons Sir Galahad spent at Owl Moon, he also became a foster parent to three juvenile red-tailed hawks that, for various reasons, could not be returned to their real parents. Each time, Sir Galahad came through. He treated them well and showed them how to be a red-tail. 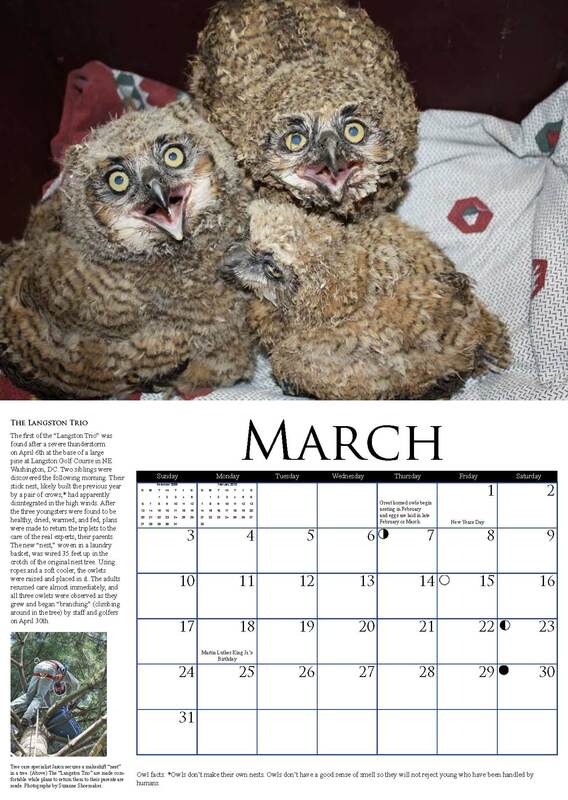 Two of the juveniles were released here at Owl Moon, and both made visits to the mews from time to time. I like to imagine they were paying a visit to their old mentor, but the handouts I left for them to help them get by while they were learning to hunt on their own probably enticed them as well. Saying goodbye to Sir Galahad is a mixed blessing for me. I am happy to have the mew open for newcomers, but I will sorely miss seeing him every day. I am thrilled however, that Meadowside Nature Center will be his new home! Meadowside’s large mew and caring staff will provide him an excellent home. The staff is excited at the prospect of training him and providing regular exercise outside the mew. Lisa will be his handler, and I will be helping her learn the techniques of training a hawk to fly to the glove. Best of all, Meadowside is only 20 minutes from my house, so I can visit him often! If you would like to meet Sir Galahad you can visit him at Meadowside Nature Center. He will be used in their education programs, and when he has completed training you may even be able to see him fly to Lisa’s glove. Be sure to send us a message or a picture if you do. We would love to hear how he is doing! Here I (left) am introducing Sir Galahad to his new handler, Lisa (right). Photograph by Maura Wade. Squeak-toy and Soldier-girl moved into spacious new outdoor quarters this week. Needless to say, these two are thrilled to be in a large enclosure where they can easily keep a “safe” distance from me and other potential intruders. When I go in to care for them Squeak-toy starts up with his signature squeaking and Soldier-girl makes several fly-bys before settling on a high perch to keep an eye on me (and the food). Soldier-girl has asserted dominance, which is no surprise given her larger size and superior flying prowess. Squeak-toy learned fast that if he minds his own business and lets her eat first, all is well. We continue to work with Squeak-toy as before, but have not been able to begin training him yet. I learned from Dr. Barb that Soldier-girl arrived at OPVC on November 7 with a comminuted (fragmented) fracture of the tibia and fibula of the left leg. Because it was comminuted, the bone was splinted rather than pinned. Raptors who have incurred leg injuries should not be exercised on a creance line, which attaches to jesses on the legs, so exercise in a flight cage will have to provide enough pre-release reconditioning for Soldier-girl. Given her inclination to fly in circles at my approach, I think she will do fine. Shredder has been flown on a creance two times since the pin was removed from his wing. While his flight and his inclination to fly have improved, his flights are shorter than we expected. His skill and stamina will need to improve before we can release him. 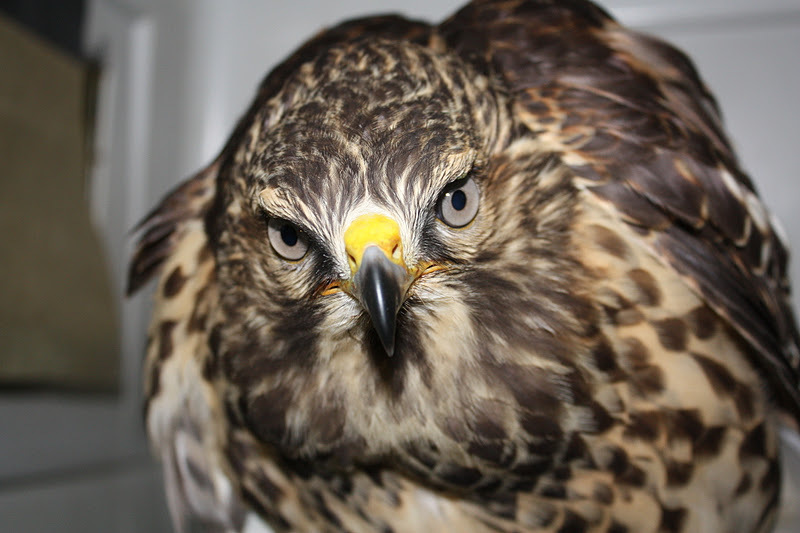 We plan to fly Shredder every other day (weather permitting) until his endurance improves, and then every day, to build his flight muscles. We began physical therapy this week to increase range of motion in his left wing, which we hope will speed up his progress. Until next week! Soldier-girl puffs up, ready to strike at any hands that venture too near. Photograph by Suzanne Shoemaker. A feisty new lady joined the ranks of Owl Moon patients this week. 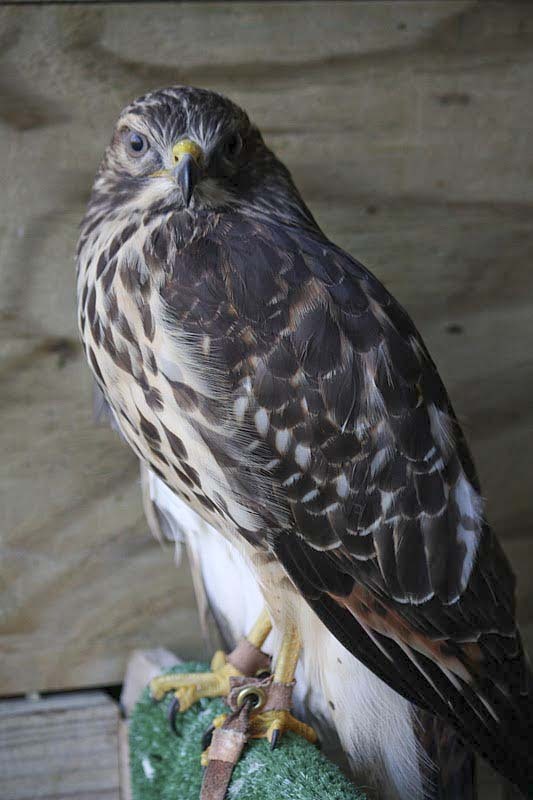 She is, like Squeak-toy, a juvenile red-shouldered hawk. However, “Soldier-girl,” being female, is considerably larger than Squeak-toy, a male. 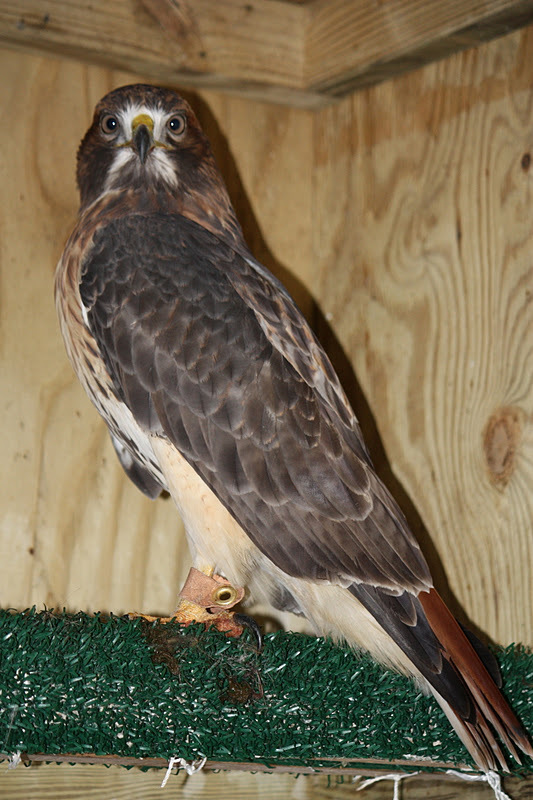 In raptors, unlike most bird species, females are typically larger than males*. Whereas Squeak-toy weighs in plump at 620 grams, Soldier-girl is lean at 880 grams. Both birds have similar personalities and I am curious to see how they get along when placed together in an outdoors mews, which is due to happen this weekend. They are alike because both are brave and quick to take the offensive when approached. For example, DO NOT make the mistake of reaching into either crate to place a water dish or food down without donning heavy gloves first. 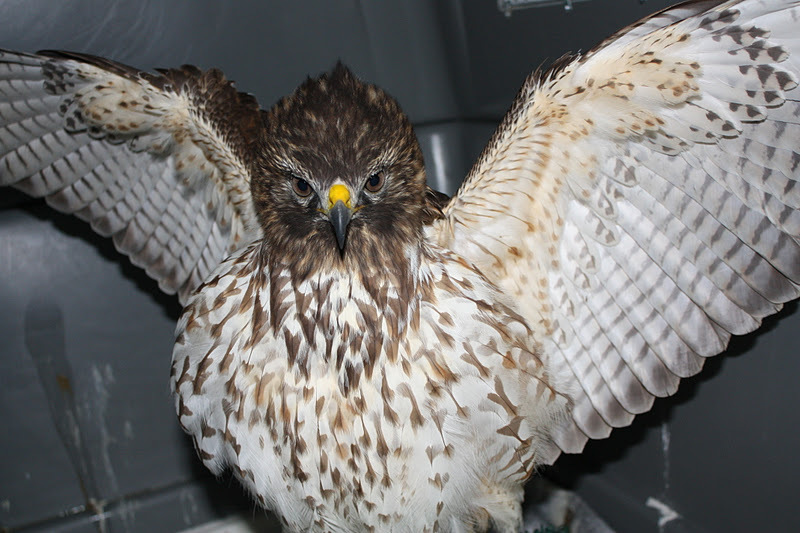 Before you know what hit you, you will be cradling your hand and an angry red-shouldered hawk will be glaring at you from its perch daring you to try again. Squeak-toy, being a veteran, can get the message across with a look in his eyes alone now, but Soldier-girl puffs up and raises her wings to send the point home. Both birds will let you know, in no uncertain terms, if/when you are offending them. 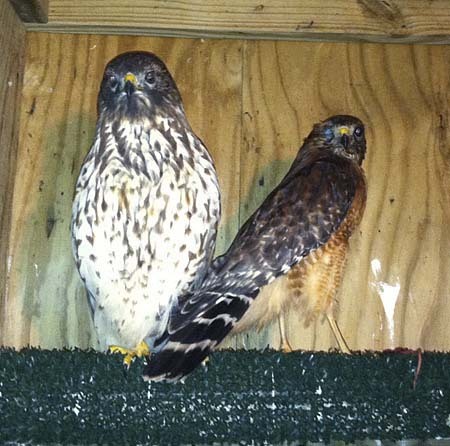 Red-shouldered hawks are known to be vocal raptors, but these two take the prize. Squeak- toy starts up with some short squeaks (hence the name) as soon as he hears someone approaching and the calls increase in duration and volume with handling. Soldier-girl, on the other hand, gives little warning, but blares with great volume once in hand. They give a repeated series of loud, long kee-aahs that can be quite alarming. It is easy to imagine how their calls might cause a predator to drop them! As to how Soldier-girl wound up in rehab, I’ll have to fill you in on that when I get more history from my vet, Barb Stastny. For now I only know that she had a fracture in her left leg which Barb repaired with a pin. Soldier-girl recovered from surgery at Opossum Pike Vet Clinic for two weeks before being transferred to Owl Moon Raptor Center last Friday, for continued care and reconditioning. Squeak-toy gives me the look that says "back off!" Photograph by Suzanne Shoemaker. Squeak-toy continues to receive physical therapy and flying time, but his recovery is not going as well as I’d hoped. He has not regained enough extension in his right wing to fly well, and despite our daily routines, his progress has slowed. I’ve decided that the next step is to train him to fly to the glove. 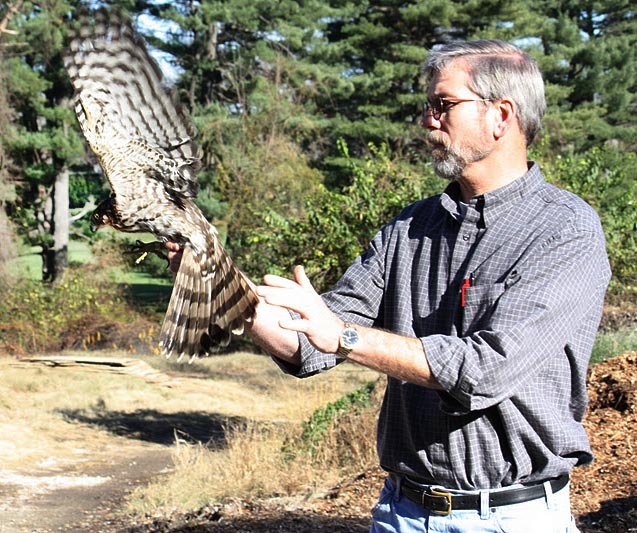 This will serve two purposes: first, it will allow me to work with him and fly him more frequently without assistance (creance flying requires two people); and second, it will make him easier to place as an education bird (both for and his handler should we find that he is not a candidate for release. In my experience as a falconer, the training will not make him less capable of surviving in the wild if Squeak-toy does recover enough to release. Trained birds that were reared in the wild by their parents will revert back to the wild state rapidly upon release. Shredder after a satisfying, if somewhat messy, dinner. Photograph by Suzanne Shoemaker. Meanwhile good ‘ole Shredder, the great horned owl, has been outside for close to two weeks now. After the first week we attempted to fly him on a creance line to assess his flight, and begin to recondition him for possible release. What we discovered was, though his wings had the mechanics for flight, he was very reluctant to use them. A feint grinding I heard and felt when I rotated his wing through the motions of flight was cause for further anxiety. I called Dr. Barb to schedule him for a follow-up exam and x-ray. Barb saw him the next morning. She found that the pin, which was still in the mended humerus (upper wing bone), had slid upward, and protruded enough to rub on his shoulder blade when he lifted his wing (hence the grinding sound). It had not broken the skin nor caused any damage, but it was painful and a problem. Fortunately, the pin was no longer needed so Barb removed it. Otherwise, Barb was pleased with the way the bone had healed and gave him a good prognosis for release. What a relief! Shredder needed another round of antibiotics and another week in the mews to recuperate, but the important news is that no new harm was done to wing. Already he is more active in the mews, and I look forward to seeing him fly on a creance this weekend. Until next week! * There are several hypotheses for why there is so-called “reverse sexual size dimorphism” in raptors. 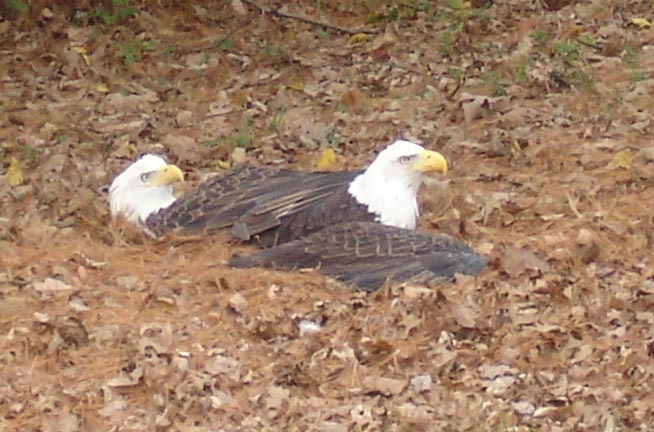 One is that the difference in size allows mates to hunt different size prey, so there is less competition and more complete use of resources on a nesting territory. It makes sense that the female would be the larger, because she needs greater reserves for developing eggs and for the long period of incubating eggs and brooding young.